The Objective: To obtain droplet size distribution/ Sauter mean diameter of liquid droplets, entering from the top nozzle to the venturi. Solution: The droplet size distribution and Sauter mean diameter (D32) was calculated assuming suitable model for particle tracking, droplet breakup, coalescence and heat transfer. Using different mean diameter calculation approaches, the droplet diameter was calculated at given plane. Gas scrubbers utilize high velocity liquid droplets to absorb solid particles and filter the gas stream. The scrubbing process is largely dependent on the ability of the nozzle to finely atomize the liquid spray into number of droplets. It is also crucial to maintain the droplet size distribution and diameter to a substantial distance inside the venture, in order to effectively absorb the solid particles in gas. A leading process equipment manufacturer from U.S., needed to evaluate the nozzle design and identify mean droplet diameter, in order to improve the scrubber efficiency. 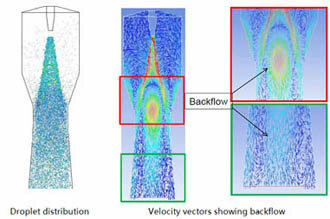 In order to accurately measure the droplet size distribution and mean droplet diameter, the simulation domain was first modeled through CAD tools. 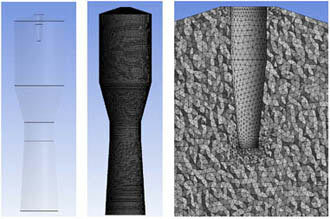 Finer mesh was applied near the nozzle injecting area to capture accurate physics. Discrete Phase Model (DPM) was used for particle tracking and pressure swirl model was utilized for droplet injection. Maximum and minimum droplet diameters were measured using different measurement approaches.